Out of all of the dessert posts I’ve written so far, this sweet bread is by far the healthiest. I understand it may not be healthy by everyone’s standards, but when it comes to desserts, my standards are pretty low. 😛 To add further insult to this bread’s potential “healthy” status, one of my favorite ways to eat it is toasted with salted butter. I know, I know, not at all healthy, but holy mother-of-all-that-is-delicious is it good. You’ve GOT to try it. I’ve never been a huge fan of banana nut bread. I mean, I would never turn it down if that’s what was being served, but if I had the choice, I’d go with something else. 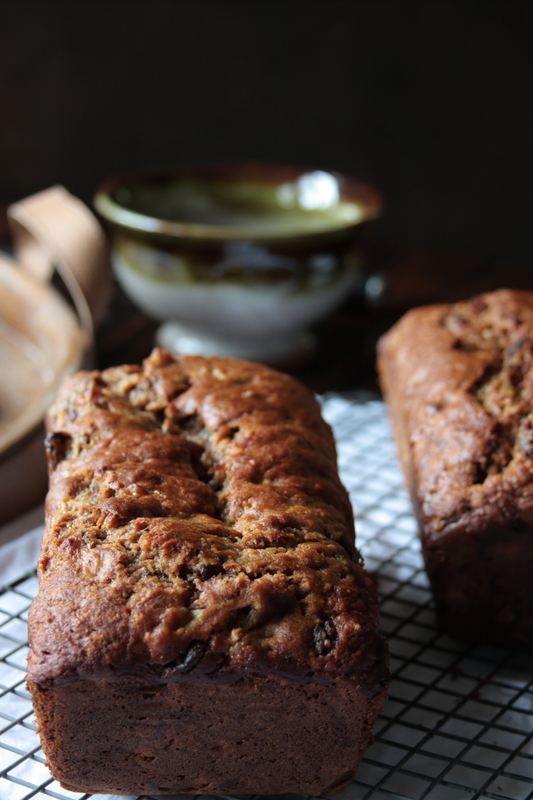 I adore ginger though, so when I found this banana ginger bread recipe years ago, I thought it might be the perfect replacement recipe to use up super-ripe bananas every time I had them lying around. 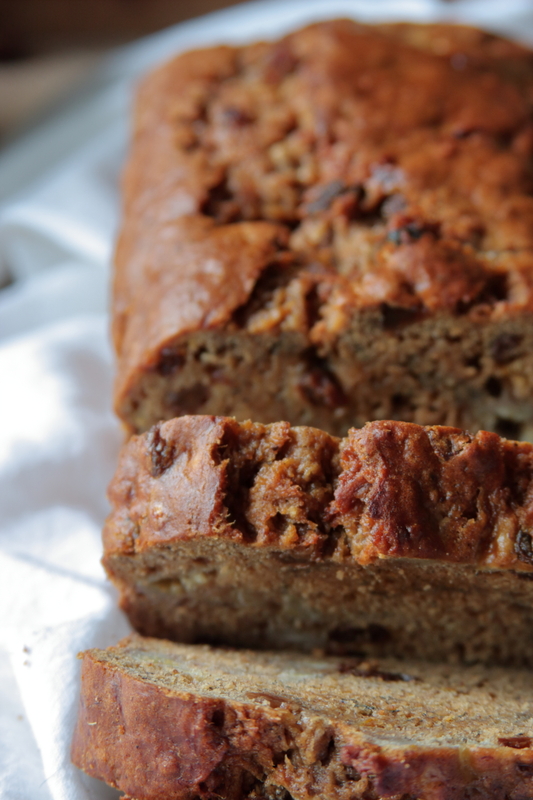 I’ve made several adjustments over the years, but now it’s my super-ripe banana go-to recipe. Usually when I make this bread, I make it in an 11×7 inch pan along with a few mini loaf pans. The wider, thinner loaf means you don’t have to bake it for quite as long to get the center to cook through, which means the outer edges of the loaf don’t get over-baked as easily. I know 11×7 inch pans are not necessarily a staple size everyone has in their kitchens though, (I know I had to go out and buy the pan the first time I made the recipe), so I converted it to a more standard loaf pan. By lowering the oven temperature and baking it for a bit longer, the center will cook through without over-baking the edges. If you decide you do want an 11×7 plus a few mini loaves, bake them at 350 degrees for 35-40 minutes. Something new I tried when I baked a few batches this time, was using fresh ginger as well as ground ginger. Generally, I use 4 teaspoons of ground ginger, but I figured it’s banana GINGER bread after all, so the more ginger I can work into it, the better. True to form, when I made one loaf using only ground ginger, and one loaf using half ground ginger half fresh ginger, my husband preferred one while I preferred the other. I swear, every time I make a few versions of something to see which one is better, we NEVER agree on which one is best. The all ground ginger version definitely is a bit spicier and stronger tasting whereas the half ground half fresh version wasn’t quite as strong tasting ginger-wise, but it had an additional dimension of ginger flavor. 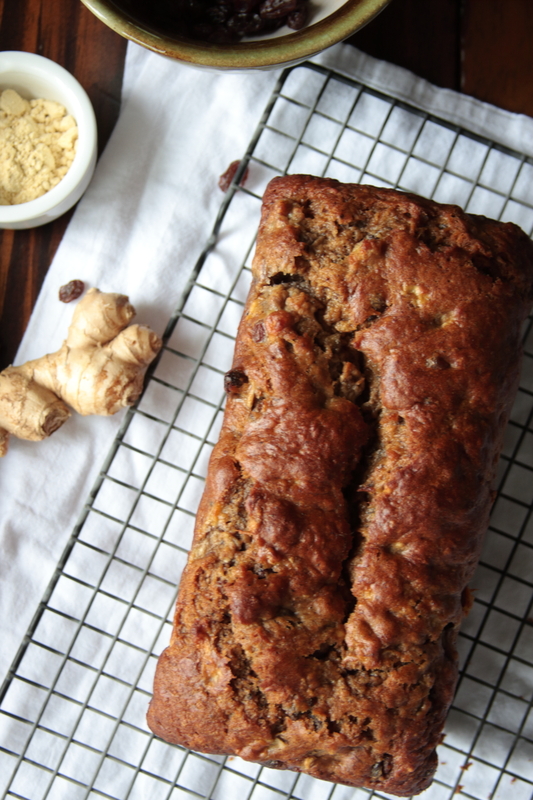 I prefer the all ground ginger version because for one, it’s much easier than peeling and mincing fresh ginger, and second, I really love the extra potent spiciness of the all ground ginger loaf. You’d probably need to put three times as much fresh ginger into the batter to get the same level of spice. Really, they’re both delicious and it’s up to you and your personal preferences. Either way, you won’t be disappointed. Super moist, sweet and spicy. Soooo good. 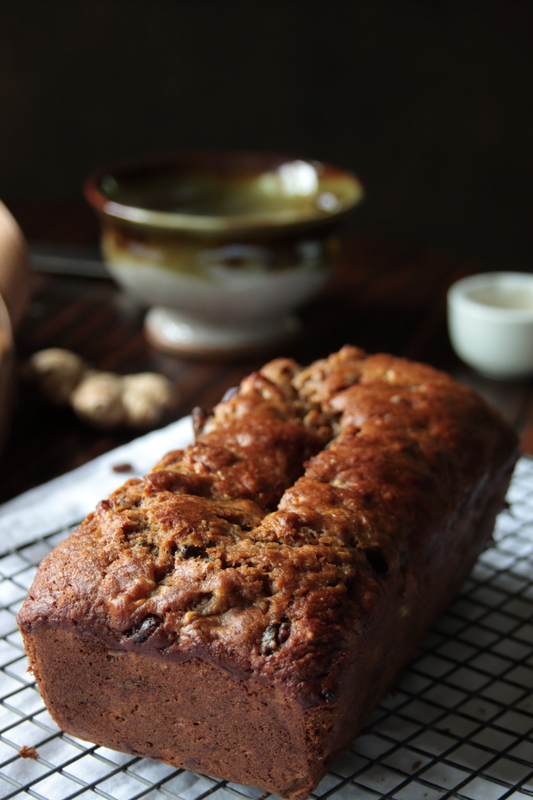 A super moist, sweet and a bit spicy quick bread. Tastes even better the next day so make it a day in advance to truly appreciate the flavors. 1 teaspoon cinnamon can substitute 2 teaspoons pumpkin pie spice for cinnamon and next 3 spices. 56 grams coconut oil 1/4 cup, just barely melted, not hot. Can substitute sunflower oil or vegetable oil. 59 ml orange juice 1/4 cup, about one medium orange worth. Whisk together flour, spices, baking soda and brown sugar. Make a well in the center of the flour mixture and add oil, molasses, vanilla, eggs, orange juice and orange zest. Mix dry ingredients into wet thoroughly. Coarsely mash bananas and fresh ginger (if using) together with a large fork. Gently fold into the batter, along with the raisins, until completely incorporated. Pour into prepared loaf pan and bake 45-55 minutes, or until a skewer stuck in the center comes out with a few moist, not wet, crumbs. Keep in mind there are a lot of bananas in this batter which can look like wet batter on your skewer. Do not over bake. Leave in loaf pan to cool for about 5 minutes, then remove from pan and finish cooling on a wire rack. This loaf is even more moist and flavorful on day 2. For the best flavor, put the completely cooled loaf in an air tight container overnight. Slice and serve the next day. 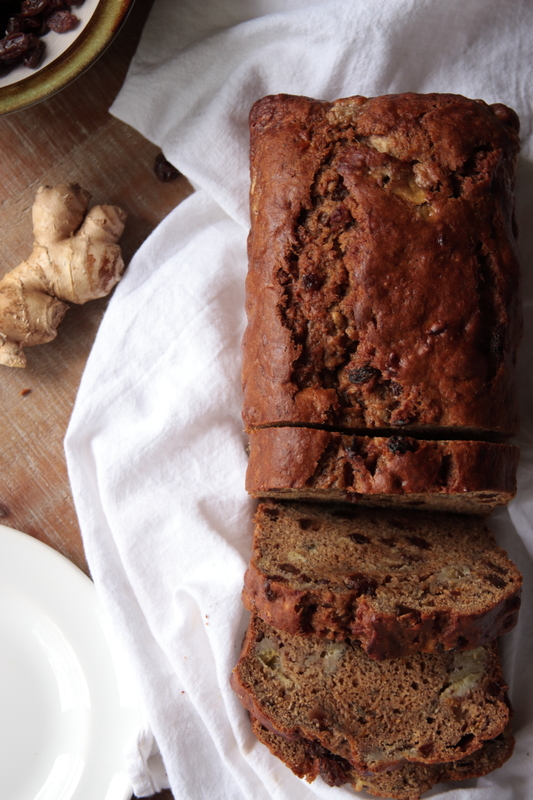 Inspired by The Ultimate Healthy Eating Cookbook's banana ginger bread recipe. So are you thinking ground ginger or fresh ginger? 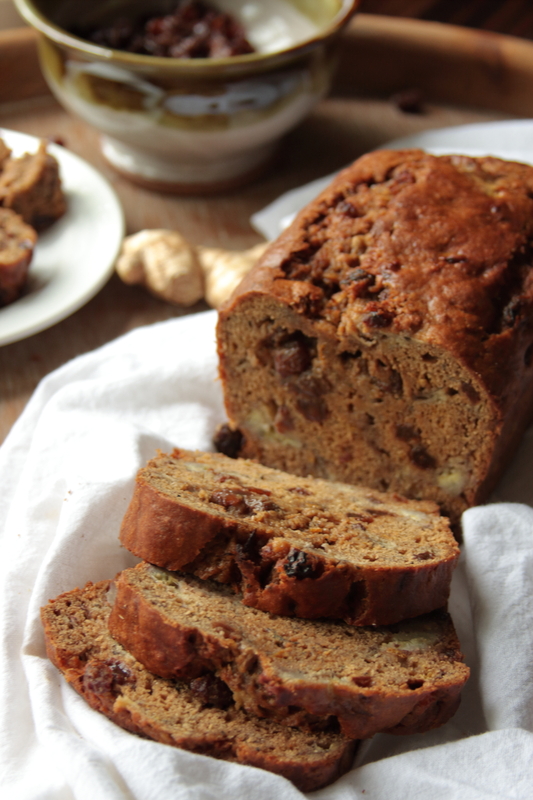 If you were the judge in a bake-off between banana nut and banana ginger, who would win? Would this qualify as health food in your world too or is that only true in my sugar filled universe? Comment below!